Simply enter your details below, select your preferences to receive email notifications of job opportunities that are relevant to you. Market rate Negotiable £0 - £15,000 £15,001 - £20,000 £20,001 - £25,000 £25,001 - £30,000 £30,001 - £35,000 £35,001 - £40,000 £40,001 - £45,000 £45,001 - £50,000 £50,001 - £55,000 £55,001 - £60,000 £60,001 - £65,000 £65,001 - £70,000 £70,001 - £75,000 £75,001 - £80,000 £80,001 - £85,000 £85,001 - £100,000 £100,001 - £120,000 £120,001 - £150,000 £150,001 - £200,000 £200,001 - £250,000 £250,001 - £500,000 £500,001 or more. You can cancel or edit your job alerts at any time. I consent to receive marketing emails about industry updates, news, events, services, similar jobs that match my criteria and any marketing offers. You can unsubscribe at any time, by using the unsubscribe link at the footer of our emails. A job alert is a notification that is sent to you by email when you create an alert with specific job criteria that you determine (e.g. location, practice area, job title, salary range, etc.). 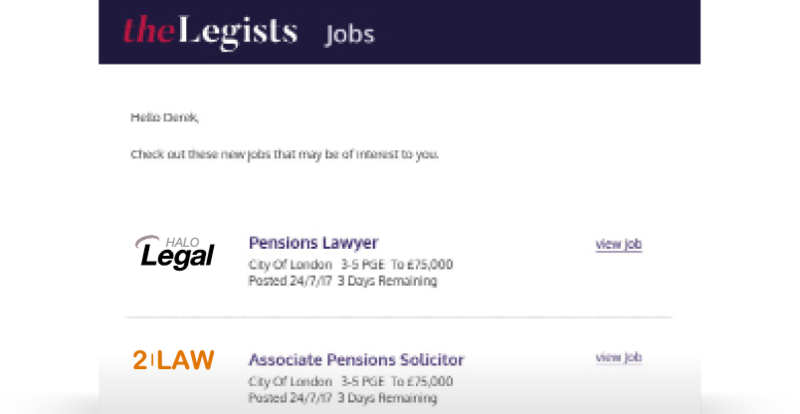 Whether you are looking for a new role in law, simply want to monitor the market, or to ensure you are ahead of other candidates, instant job alerts mean you will never miss an opportunity. Job Alerts are the easiest way to look for a job. We do the searching and you only receive notifications of job opportunities that are relevant to you. Be the first to know about your preferred job opportunities and be the first to apply. Save time by using our Job Alert function to stay up-to-date on new opportunities.